WRENTHAM, Mass. -What has made King Philip tough to beat all season is that the Warriors can count on multiple players to come through on the offensive end. It is hard to defend a team with multiple players that can put the ball in the basket. That continued on Monday night in the opening round of the state tournament against Quincy as KP had three players hit double figures, and each stepped up in different quarters, to make it a successful return to the playoffs following a five-year absence. 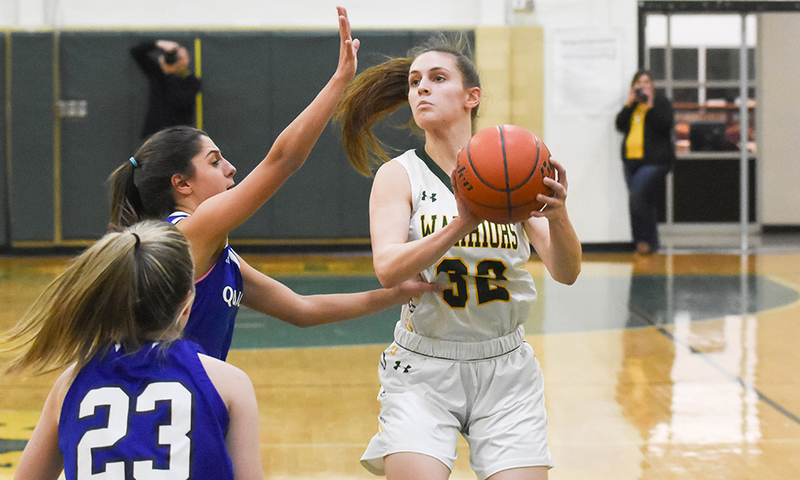 Faye Veilleux scored 12 of her game-high 16 points in the first half, Faith Roy scored eight of her 10 points in the third quarter, and Shannon O’Connor scored 10 of her 13 points to close out the game in the fourth to seal a 63-52 victory. Quincy is a team that likes to run and press and turn the game into a track meet. In the first quarter, the Warriors tried to match them stride for stride and it created a frenetic, fast-paced game, but one that suited the visitors. Veilleux knocked down a jumper off a Roy assist and O’Connor drilled a three to get the Warriors off to the perfect start, but the Presidents got back into it with their speed in the open court and tenacity in the press. Brianna James scored off a Roy rebound and dish to keep KP in front 11-8 but an 8-2 run put Quincy up three after one. In the second quarter, it was KP that clamped down on defense by slowing the tempo and forcing the Presidents to try and score in the half court. Emma Glaser (eight points and 11 rebounds) knocked down a jumper and Caroline Aaron came off the bench to knock down a three. Veilleux hit a pull-up jumper in transition to tie the game at 20-20. Roy got on the board with a runner and Veilleux scored after Glaser hit her with a bounce pass on the break. Six free throws later and KP went into the break leading 30-23, having limited the Presidents to just seven points in the second. Aaron (seven points) got things going in the third with a transition basket and Roy knocked down a shot off an O’Connor pass to push the lead into double digits for the first time. Roy caught fire in the third, scoring half of KP’s points in the quarter, including a three-point play off an inbounds pass from Kendall Mason that got the Warriors a 13-point lead. KP was up 11 heading to the fourth quarter, but Quincy kept hanging around. Twice the Presidents would cut the lead to as few as eight points in the final eight minutes, but each time O’Connor had an answer. She knocked down a pair of jumpers, scored on an offensive rebound, assisted on a Veilleux layup, and then hit 3-of-4 at the line in the closing minute. When O’Connor needed some help, fellow senior Julia Leroux stepped up and drilled a straightaway dagger three to answer one by Quincy on the other end and make it 61-50. With the win, King Philip (14-7) faces a trip to the top seed in Div. 1 South, Bridgewater-Raynham, on Friday night. Both coach and player were excited at the prospect of taking on the top team in the bracket. Siggens said, “We’re ready. We’re excited to be in the tournament. It’s about survival and getting to the next game. We did it tonight and we’ll see what happens on Friday. We’d love to get the upset, but they’re a good team.